The crystallized ginger on top of these cupcakes was a last minute addition. 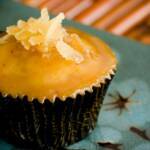 However, it rounded out the flavor of these ginger pear cupcakes with miso caramel glaze so well. 1/2 tsp ground ginger If you like a stronger ginger flavor, you can double this. Beat in flour, one cup at a time, alternating with milk. Beat on medium-high to high speed for two minutes, scraping down sides of bowl. Divide evenly between 12 cupcake liners (liners will be filled almost all the way to the top). See my post on salted caramel with miso for the salted caramel recipe. Spread the caramel on the cupcakes just before serving. If the caramel is put on too soon, it will dissolve into the cupcake. The cupcakes won't look as nice and they will become too dense. Top the cupcakes with chopped crystallized ginger.